Kim Hollis: The Martian, the Matt Damon film set in space, debuted with $54.3 million, just short of the October opening weekend record. What do you think of this result? Edwin Davies: This is a pretty fantastic result. That the film opened in the same region as Gravity despite being an hour longer (and therefore having fewer screenings) is testament to its quality, and possibly the strong reputation of the book. 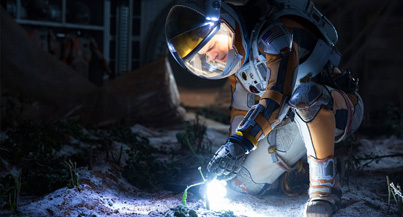 It's especially impressive when you consider that it is a lot more techy and detail-orientated than Gravity - for all its humor and spectacle, it is a film in which one of the hero's most triumphant moments is figuring out how to grow a potato. It's a really good result for both Ridley Scott and Matt Damon, both of whom had gone a long time since an unqualified hit. Scott had success with Prometheus three years ago, but the toxic response to it killed its legs after a strong opening, and the years before and after that are littered with expensive failures and minor successes. Damon, meanwhile, has had success as parts of ensembles in films like Interstellar and True Grit, but otherwise this is his first huge hit as a lead since The Bourne Ultimatum. Both of them come out of the weekend looking a lot better than they have in a while. Ben Gruchow: This is a good result, and the product of a movie that didn't really step wrong in its marketing. I love the fact that what seems to have attracted an audience here is the concept of a scientifically-sound movie rather than sensory overload, which is the same general feeling I had with both Interstellar and Gravity (although the science in those movies was a little more embellished). I agree with Edwin that this feels a bit like a comeback vehicle for both Scott and Damon.